November 16, 2018 — Links International Journal of Socialist Renewal — This document investigates the causes of the student protests that broke out on April 18 against the Nicaraguan government’s decree changing the regulations governing the country’s Institute for Social Security (INSS). The subsequent conflict has to date claimed at least 269 lives. The research focuses on the period from April 18 to April 30 because what actually happened in these first days of the conflict is key to reaching a conclusion about which of two opposing accounts of its cause is most believable. The first account is that of the Nicaraguan government. This is that the events amounted to an attempt at a right-wing coup against a democratically elected administration , a coup successfully defeated with the minimum possible use of force. The INSS changes were merely a pretext for launching the coup attempt. For the opposition, by contrast, the events amounted to a revolt against a regime that suppressed protest with violence: police and paramilitary forces using military-grade weaponry were deployed to crush peaceful demonstrations that in reaction to state repression escalated into a popular uprising for justice and democracy. Xiomara Castro on the campaign trail. November 23, 2013 – Links International Journal of Socialist Renewal -- On November 24 the people of Honduras will elect Xiomara Castro Sarmiento de Zelaya as the first woman, and the first avowedly socialist, president of the republic. Her election, if not stolen by fraudulent methods, which is extremely likely given the terror her potential election is causing in the ranks of the ruling oligarchy, will represent the fruits of nearly 20 years of direct and organised mass struggle for social, labour and human rights. It has been a struggle against various forms of government, from military dictatorships to liberal and more accommodative forms of capitalist rule. It has been a struggle which has produced what could arguably be the most class and social conscious mass movement in the world. It has been a struggle that has produced more than its fair share of martyrs, murdered at the hands of killers hired by the oligarchs, and more than its fair share of sorrow. Flint sit-down strike (1936-1937). A vanguard layer of the working class, reflected in the vibrant militancy and radicalism of the massive Congress of Industrial Organizations (CIO). The following is a reply to Luke Cooper's "Debating 'Leninism': a reply to Paul Le Blanc", which was a response to Le Blanc's "Leninism for now". More articles by or about Paul Le Blanc can be found HERE.Click HERE to see the entire discussion between Paul Le Blanc and Luke Cooper. Below is the Introduction to Latin America's Turbulent Transitions. 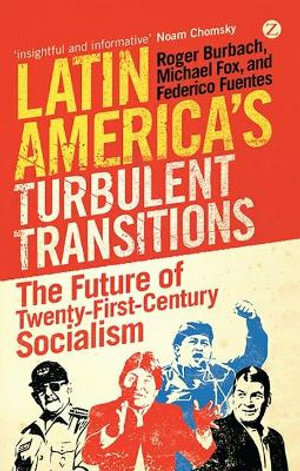 For more information about the book or to purchase a copy please visit: http://www.zedbooks.co.uk/paperback/latin-americas-turbulent-transitions. 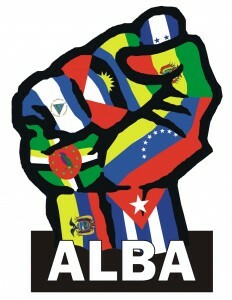 May 8, 2013 -- Alborada, posted at Links International Journal of Socialist Renewal with Federicio Fuentes' permission -- Latin America today is largely relegated to the back burner of global affairs. The conflicts in the Gulf and the Middle East, the economic crisis gripping Europe, China’s march onto the world scene, and the political dysfunctionality of the United States are the broad trends that shape our headlines. When Latin America does break into the news it is usually over the drug wars or immigration issues. The Nicaraguan people celebrate victory over the Somoza dictatorship in central Managua, July 20, 1979. July 19, 2012 – Links international Journal of Socialist Renewal --The following are two chapters from volume 2 of my political memoir about my time in the US Socialist Workers Party (SWP). They give an overview of the triumph and eventual collapse of the Nicaraguan revolution (1979 through the 1980s) under the blows of US imperialism’s war against the small and impoverished country. It is important for socialists today to not forget the victories and defeats of the past, and their lessons for the future. 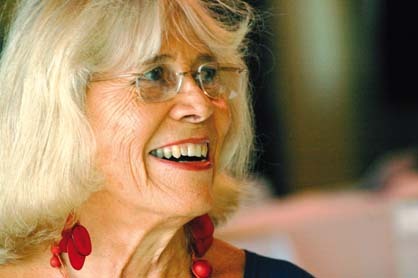 One of the lessons of the Nicaraguan revolution, like the Paris Commune, the Russian, Chinese, Yugoslavian, Vietnamese and Cuban and other revolutions, as well as revolutionary upsurges that didn’t take power, like the German one (1917 to 1923), the May-June 1968 near revolution in France, the Portuguese revolutionary events of 1974-1975, the Prague Spring of 1968, the rise of the Polish workers in 1970, etc. is the power of the workers and peasants when they enter the stage of history in their own name and interests. On November 12, Toni Solo from Nicaragua spoke to Latin Radical's Warwick Fry about the landslide electoral victory for the Alianza Nicaragua Triunfa and Daniel Ortega. May 24, 2011 -- http://johnriddell.wordpress.com, posted at Links International Journal of Socialist Renewal with permission -- On May 22, Hondura's president Porfirio Lobo Sosa and former president José Manuel Zelaya Rosales signed an agreement 'For National Reconciliation and the Consolidation of the Democratic System in the Republic of Honduras". Lobo was elected in November 2009 in a rigged vote organised by the regime installed through the June 28, 2009, military coup that overthrew Zelaya. The majority of Latin American and Caribbean nations refused to recognise the legitimacy of the Lobo government, despite the strong support it received from the United States and Canada. The present agreement, finalised in Cartagena, Colombia, also bears the signatures of Colombia's President Juan Manuel Santos and Venezuela's foreign minister Nicolás Maduro (on behalf of President Hugo Rafael Chávez Frías) as witnesses. This agreement opens the door to significant changes in the Central American political landscape and to the re-entry of Honduras into the Organization of American States (OAS) and SICA (Central American Integration System). 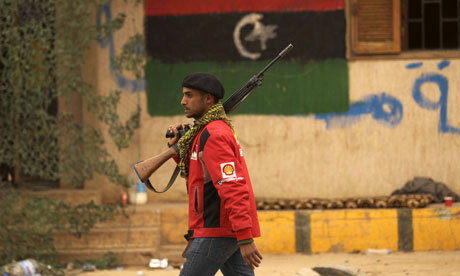 A Libyan rebel walks past a military position decorated with the rebellion flag at the southern entrance to Benghazi. Photograph: Patrick Baz/AFP/Getty Images. March 27, 2011 – Links International Journal of Socialist Renewal – The struggle in Libya cannot be analysed except in the context of world and especially US imperialism, as I am sure all will agree. But its also cannot be analysed solely in terms of Libya itself in conjunction with the role of imperialism in that single country. What is the context in which Libya must be placed? Or to put the question another way, could the civil war in Libya and the US military assault have happened four months ago? Of course not. Neither were even remote possibilities in anyone’s mind four months ago.